When a gas compression package in the field stops working, the producer’s lost revenue piles up fast. When the equipment is highly technical, the location might be remote, and every hour counts, who are you going to call? Compass clients contact Kirk Dunn. As the Director of Parts and Service, this 13-year company veteran gets clients’ equipment serviced well and serviced quickly. There’s no substitute for being close to the action and ready to respond. Compass has multiple locations throughout western Canada and the northwestern United States, including a 19,000 square foot shop in Grande Prairie, Alberta. 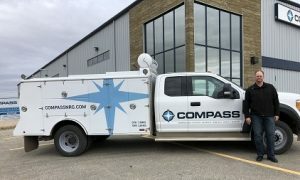 A fleet of well-stocked service trucks, complete with tooling capabilities, is ready to get Compass’s experienced mechanics to client job sites fast. If an engine can’t be fixed on-site, Dunn’s team can bring exchange units to the field – installed in less than 24 hours, in one recent job – or they can bring the parts to the site for an in-frame overhaul. From traditional set-ups to the latest technology, a service team needs to be able to provide expert solutions, and do it all. Equipment failure and extended downtime pose a major risk for producers. Kirk Dunn’s extensive parts and engine inventories, OEM-certified mechanics, and rapid service response help keep that risk in check. Problem in the field? Make the call to Kirk.